“The operation was a success. She’s recovering now.” Relief in Dr. Matthau’s voice. The older man had done a few procedures for Tzeng’s people before, just nothing like this. “Resilient child.” He commented. Mr. Tzeng nodded. So she was. Little thing, same age as his son. Wild red hair and eyes like an ocean storm. She emerged gasping and terrified. The EKG spiked fast. Jerking limbs found their restraints secure and she was sure her entire body was on fire. Tears hot on her cheeks as she panted under the oxygen mask. A nurse came with a cool hand for her forehead. She blinked her wide blue eyes, searching for some kind of anchor. A kind and motherly face, soft creases worn into her dark skin and a gentle and reassuring smile. “There, there, little one. You’re alright. Don’t move, you’ll hurt yourself.” Said the nurse. She stared up at the woman anxiously, but stilled her thrashing. Deep breaths. She closed her eyes. A shape in the dark. Something looming and shadowed, deeper than the blackness behind her eyelids. Hot red stare and white teeth. Somehow it was beautiful. “Who are you?” she asked the shape. The form reached for her. It asked her in return. The query rattled her bones, sliding like icy fingers down her spine. “Do I know you?” she tried. It repeated and the abyss of the shadow coiled around her. She shrieked and opened her eyes. The nurse was gone. There was a man in the corner of the room. She’d seen him before. A scientist working for Mr. Tzeng. He’d picked her from the orphanage. She saw him in the halls sometimes. He’d never said a word though. Now, he approached to still her panic. There was understanding in his stare, but it was frightening. Cruel plans toward platinum goals. Wei wasn't the kind to flinch at what people thought if it didn't threaten the respect he could derive from their hearts. He liked to think disgust and suspicion was his playground. If he could have fleeting enjoyment from the rising flowers of blood planted and raised by one brother's hand on one brother's forehead, then he would indulge. This project was partially that, a girl he bought because she was thrashed by life, into remains that he could use. He had precious spare parts and she had fitting damages. The angels that fell had their specific currency, but no loyalty. This would be different. Cheaper, deeper. "Good morning, Trace." said Steven Matthau. Brilliant man. Doctors are the most prestigious of laborers. Wei Tzeng liked to work with his hands, but only when he chose to. "You're going to heal quicker than what should be possible. But it is still going to be an ordeal." Merciful. Wei should remember that. Kou was also afflicted by this. "You've become two. But soon you'll feel like one, again." Poetic. Wei, sitting, sighed from behind the man in the white coat. That was in Kou, too. This girl better not grow up too much like Kou. She was going to become formidable. "But father will be here for you." The girl stared at the man in the lab coat. There was a smudge of dark blood on his wrist when the white sleeve rose above his watch. Her blood, the shadow in her skull suggested. She blinked at him. He said a name like it was hers and she couldn’t remember if she’d owned that word before. The shade said it was their name, like their was a mutual thing. She rolled that plural around in the back of her throat. “Trace.” She repeated it back. He said things that made sense. She was two things. Or there were two things. Trace was Trace and so was the shadow. The shadow had said so. Trace blinked at him. There was a spot of red, brighter than the dried smear the doctor had missed at the sink. “I will feel like one again?” she asked him. It wasn’t a dumb expression on the young face, just confused. “I am one.” The darkness said with the girl’s mouth. Trace rubbed her eyes. “Trace is Trace.” She said, and the deep black was pleased. They would exceed expectations. They were better than the dreams of this man and his white coat. They were greater than the dreams of Mr. Tzeng. The shadow knew because the shadow had lived these ambitions as its spine was plucked from the space between its burnt away wings. Trace screeched suddenly. That had hurt, when they’d taken the parts out of her. They were back now, stitched in tight. The wraith-thin girl was gasping. “It hurts. It hurt. We—I hurt.” She panted. “Why did you do this to us? What do you need us for?” she asked. The doctor had done his work, and would monitor the girl, of course, but most of it was just formalities now that the implants were in place, drinking and purifying her blood. That was how Wei saw it. She had lived this long, through all the hazards of becoming replaced and rebuilt. Perhaps he was also deeply afflicted with a sin, the same as the one the girl was being devoured by and becoming. If you are destined to for greatness - which his position at the head of the criminal world, his cosmos, this city, suggested - then greatness will come. It suited him that she should be the one to take him further. Enough of her predecessors had failed. It would satisfy him if the tradition of dying specimens ended with her. Her screech was also a formality to him. Beautiful sound, really, so he let himself enjoy it. If she became what he wanted, then remembering her agony would be as delectable and exquisite as recalling a seed when standing at the foot of a great tree. He stood from behind the doctor, and touched the back of his hand to the sleeve of the lab coat, which lead the bloodied man to the side, so Wei could take his place by her bed. "I did it to you, trace." Wei said and wondered if she liked the only color on him today, the tie with hue of the life she'd spilled for this. He smiled in a way that was meant to speak to her heart, in a way his son would have loved and remembered. There was nothing on the line if Wei showed affection to Trace. In many ways, she was his daughter. He reaches to touch her cheek. Her demon had fallen for Pride. Would it know it on him through the tender contact? Her skin was feverish and cold, dying and being born. He was a cold thing with a warm expression, shadows haunting the socket of his black eyes but with gentle on his lips. "You were born of the empire, Trace, so you'll just expand it to your glory with me." He was a good father when it benefited him. And she was a beautiful child. "When this pain is gone, you will be the warden of your own suffering, and you will buy fantastical things with it." Because what greater pride is there to take, than the one in your living legacy? Trace watched as the king of the Tzeng empire emerged from behind her surgeon. He was a man she had come to know well. Better now, because both halves of her knew him. A new father to her on paper. The dark shade trembling along her spine had seen him as a gleaming light. Enough pride in that man to swell the Demon’s reach, the shadow would have wrapped itself around his vertebrae if it could have reached. But this girl was a young well of potential, and close to a Father who would feed her. The abyssal black was not discontent. “You did?” she asked, and shivered because that sort of hubris sang to her soul. He had not done it himself. 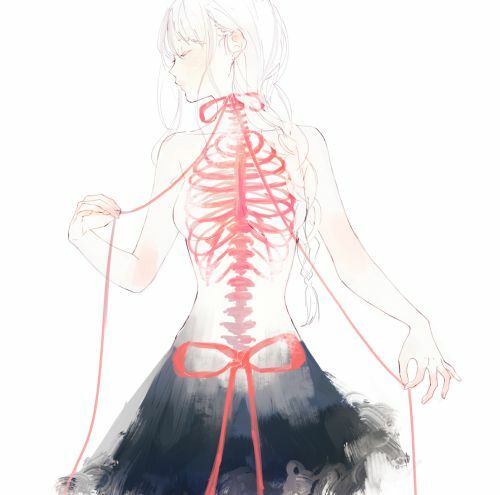 It had not been his hands that had sliced open her skin and grafted the shimmering cord under her aching bones. But the act was his now because he claimed it. With money and influence, he looked down at her because he could. It made her quake. What a Father. When he touched her cheek, she closed her eyes and basked in the affinity there. New ties. They were the shadow’s, so they were her own. The red in her stare bled fast when she reopened them; the hungry thing coiling at the base of skull was eager to take and give, pulling tides and washing against her small psyche. It made her head hurt, but she strained to listen to Mr. Tzeng and his pretty dreams. “My glory. Of course.” The dark said with her teeth. “This small world should be afraid then.” Trace said, blinking up at Father. She sighed then and slumped back against the bed, fists clenched against her restraints. The Demon was ambitious, but the girl was small and frail. She would become strong though. Her glory demanded it. Perhaps the child had wanted a family. The Demon moved her without resistance. Father’s empire needed her, after all. She would be the success he’d yet to taste. Be proud, make him proud. An Icarus that could swallow the sun. Trace was released from the hospital after a week and brought to Wei’s home. Unprecedented recovery. Remarkable, really. Her eyes were red.